Phi Omicron Zeta chapter used the 2016 Founders’ Day not only to honor the Five Founders or Pearls but also to get the next generation involved - Amicettes and Archonettes, with the Get Engaged initiative. The celebration began by honoring the history of the sorority and migrated to a skit by the Youth, which focused on consequences of young girls using Social Media improperly. 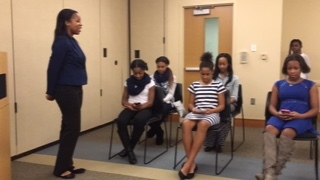 The Youth performed two skits; one demonstrating improper use, and the other demonstrating proper use, of Social Media. Then the sheriff of Newton County, Sheriff Ezell Brown and the Assistant Principal of Cousins Middle School, Soror Alison Jackson led an interactive forum and shared the educational and legal ramifications of the improper usage of Social Media. They also emphasized that images or videos posted to Social Media are permanent and would follow them and affect their lives throughout their professional future. The program ended with the #IHaveADream Campaign. Some Sorors shared a younger picture of themselves and each Soror shared words of wisdom with our Youth on what we wished we had known when we were that age. Refreshments were served as everyone interacted with our dynamic speakers. 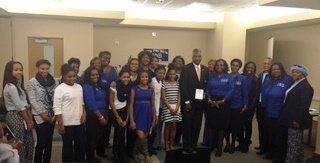 This event was well attended by Sorors, Amicettes, Archonettes, Amicae, parents and friends.